Füssen, Germany ~ Monsignor Art Bastress pastors St. Alphonsus Parish in Baltimore, MD — the only remaining church to claim both St. John Neumann and Blessed Francis Xavier Seelos as former pastors. The lives of these two Redemptorist priests, especially Seelos, continue to renew him in his commitment to God, even after decades in the priesthood. Msgr. Bastress, who became a Redemptorist Oblate in 2009, has traveled several times to the National Seelos Shrine in New Orleans. 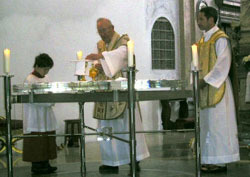 Today he presided at Mass at the Basilica of St. Mang (Magnus) in Füssen, Germany, where Seelos was baptized the day he was born. The monsignor brought with him a first-class relic of Blessed Seelos, and placed it on the altar for Mass — in a sense bringing Seelos full circle back to his homeland. “I’ve found today a specialness, a newness in the priesthood, even at the age of 85,” he said. The basilica, which dates to the 15th century, is a soaring sacred space, much larger than we expected. The interior strikes you as a restrained Baroque style, exquisite rather than overpowering. The shrine to Seelos at a side altar is quite modest (as self-effacing as the so-called "cheerful ascetic" himself), with a small photo display and only a few votive candles. And yet his spirit was very much present, there at the basilica and throughout the town. Füssen is a charming Alpine village near the Swiss border, not far from Oberammergau (the home of the famous Passion Play). Many of the buildings are painted cheerful colors, and the fire hall is as thoroughly frescoed as the arms of a tattoo artist. Paintings or sculptures of the Blessed Virgin adorn upper stories of several buildings. Maryland historian Dr. Robert Worden, one of our band who had been to Füssen before, led us first to Seelos’ childhood home at Spitalgasse 13. There the boy known as Xavier expressed interest in following the lead of his namesake in preaching the gospel in foreign lands. Then we cut through the main square and down side streets to find a wall painting many locals may not even understand. It depicts Seelos in America, circa 1850, tending to European immigrants and former slaves. A mission cross is tucked into his distinctive Redemptorist garb. Msgr Bastress marveled at the missionary drive that led young Seelos across the ocean. "I’ve always needed a hero," he said. In Blessed Seelos, he’s found one. More photos of the pilgrimage group’s visit to Fussen and St. Mang Basilica, courtesy of Myke Rosenthal-English. Click here for video from the Mass.